One Stop Horse Shop are very excited that they now have a lovely standard double horse float, available for hire at very affordable rates, from their Smythesdale store, at 27 Brooke Street, Smythesdale. Our float is an older float, that was rebuilt completely around two years ago, with all the modern bells and wistles. It has fully padded sides, a fully padded removable divider, stallion divider, hydraulic breaks, jockey wheel, rubber floor etc. 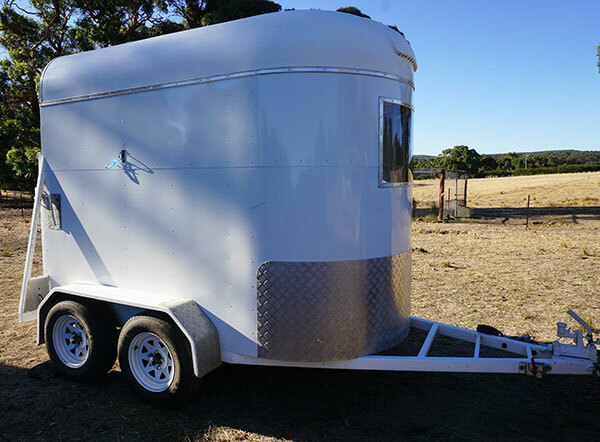 Whilst it is a standard sized horse float (not extended), we have found larger horses (tested up to 16.2hh) fit in quite comfortably, either in the standard straight load position, or you can allow them extra room by moving the divider to one side, or by removing the divider completely. Pick up and drop off for the float, can be arranged as per our standard shop opening hours. Or, if you need it early in the morning, you are welcome to pick it up from the shop the evening before, so long as you let us know in advance. We do require some advance notice for the most part, as we don't store the float on site at the shop. We tend to only bring it in when its booked to be hired. The 'Weekend Special' rate allows you to pick up the float on the Friday evening (between 5pm and 6pm), use it all weekend long, and then return it by 9.30am Monday morning. To book, you can either drop in and speak to Sarah, Toby or Leanne, or you can call the store during trading hours, on 03 4301 7383. If you do need it at the last minute, you can also text or call Sarah, on 0401 764 169. The only main conditions that we have, is that the float is returned in the same condition as it was hired out to you. As this float is quite precious to Sarah & Toby, we simply ask that you take care with it, and sweep out any manure. Whilst we realise that accidents can happen, any damage you cause, does need to be reported to us when you bring it back. Extra charges may apply if any damage occurs. All hirers must provide their Drivers License (which we will photocopy), their vehicle registration details and sign a hire agreement. And yes, we will hire to P Platers! The Hire Fee is expected to be paid upfront, on collection of the float.